This course, will take you through a full day of clinical reasoning delivered through a combination of lectures, practical demonstrations and interactive discussions. This three hour evening seminar will cover the basics of delivering pain education material to patients in the clinic. It will also look at ways to involve the patient’s goals and expectations in the way you plan a rehabilitation program. Presented by Dr Ebonie Rio. 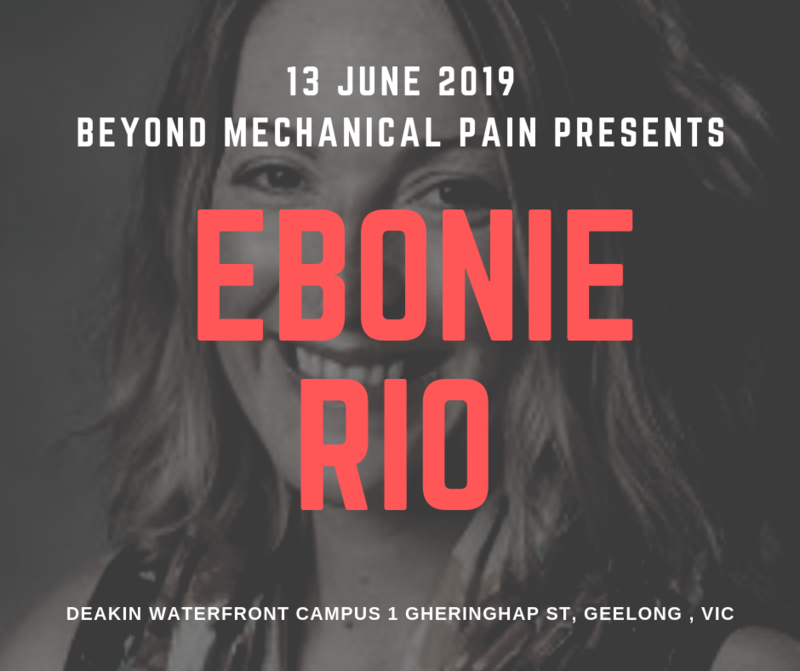 Ebonie is a post doc researcher at La Trobe University and has completed her PhD in tendon pain, Masters Sports Phys, B. Phys (Hons) and B. App Sci. Her clinical career has included Australian Institute of Sport, Australian Ballet Company, Australian Ballet School, Melbourne Heart Football Club, Alphington Sports Medicine Centre, Victorian Institute of Sport, 2006 Commonwealth Games, 2010 Vancouver Winter Olympics, 2010 Singapore Youth Olympics, 2012 London Paralympics, 18 months travelling with Disney’s The Lion King stage show (Melbourne and Shanghai tour). Dr Rio will be talking about everything that clinicians need to know about the latest science around diagnosing and treating tendon pain. 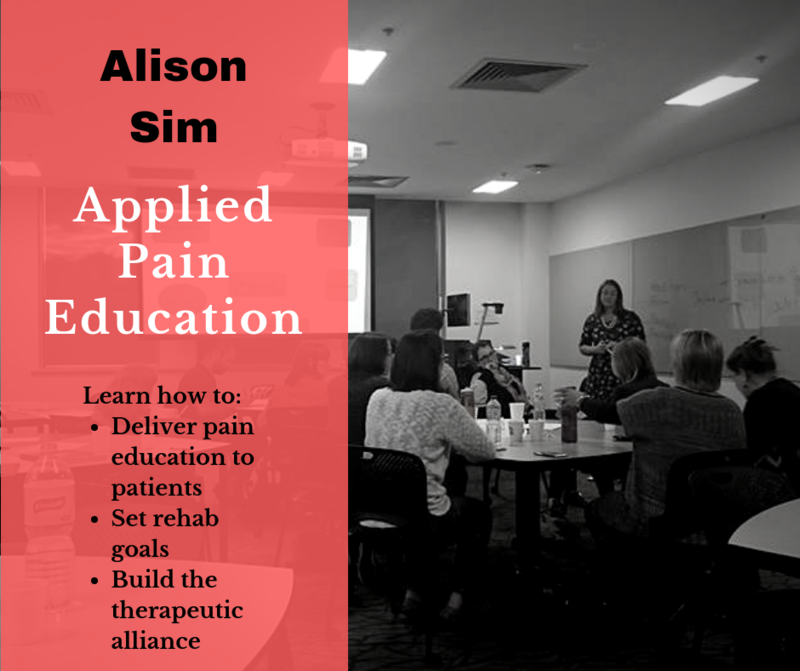 Presented by osteopath and pain management clinician Alison Sim. This three hour evening seminar will run through the basics of Motivational interviewing technique. This approach is known to help create better rapport with patients and ultimately get better uptake of health advice. Pain Science 101 is a 3 hour lecture that covers the fundamentals of pain, and how clinicians can apply this in practice, presented by Della Buttigieg, an osteopath with over 15 years of neuroscience lecturing experience. This lecture is perfect as both an introduction to the complex topic of pain, or as a refresher with excellent clinical insight. Presented by phyiotherapist Blaise Doran. This 3 hour seminar will cover physical therapy approaches to assessing and treating chronic pain in children. Details of the panel to come soon.